Presented by leading international trade fair organiser, Messe Muenchen South Africa, fdt Africa will be staged at the Gallagher Convention Centre from July 9-11, 2019. For the first time, it will be co-located with IFAT Africa – the premier environmental technology trade fair for water, sewage, refuse and recycling, as well as analytica Lab Africa, the international trade fair for laboratory testing, analysis, biotechnology and diagnostics. fdt Africa covers the entire food and beverage process chain – from raw materials and processing through to packaging and logistics. Now, with the event’s co-location with IFAT Africa and analytica Lab Africa, delegates will also be able to explore lab equipment, analysers and services, as well as water and waste processing and treatment technologies, all under one roof. Messe Muenchen South Africa’s co-location of these three events maximises the overlaps and synergies between the three sectors, giving an expected 6 000 visitors access to the latest technologies across the entire value chain, including solutions to key industry concerns such as quality assurance, packaging, environmental issues and waste management technologies. fdt Africa has renewed its supporting partnership with Food SA in 2019, increasing the industry focus on the food sector. Additional highlights at fdt Africa includes a knowledge-sharing forum and a B2B matchmaking area for key decision-makers, manufacturers, new business owners and agro-business stakeholders. 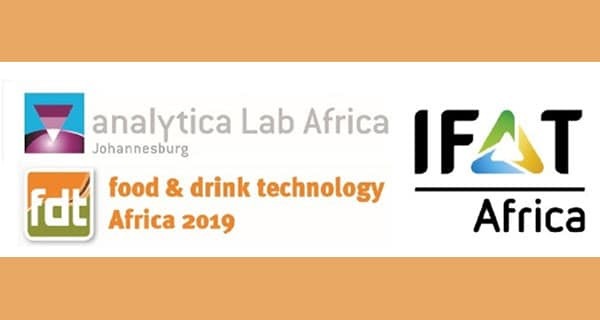 Exhibition space is still available to leading food and drink technology manufacturers and solution providers wanting to participate in fdt Africa 2019.